UNC Wilmington women’s basketball returned to the Port City knowing that it needed to bounce back after two consecutive road losses last week. It did that in a huge way on Friday night as the Seahawks played host to Hofstra. Riding a wave of hot shooting as well as big nights from four in double figures, the Seahawks (12-7, 5-3 Colonial Athletic Association) were in cruise control for the whole of their 89-54 victory over Hofstra in the annual “Pink Game.” UNCW led by 40 points at the end of the third quarter and shot 55 percent from the field as a team. The Pride (7-13, 1-7 CAA) had difficulty slowing down Seahawk redshirt junior guard GiGi Smith, who led all scorers with 18 points on 7-of-14 shooting to go along with six rebounds. 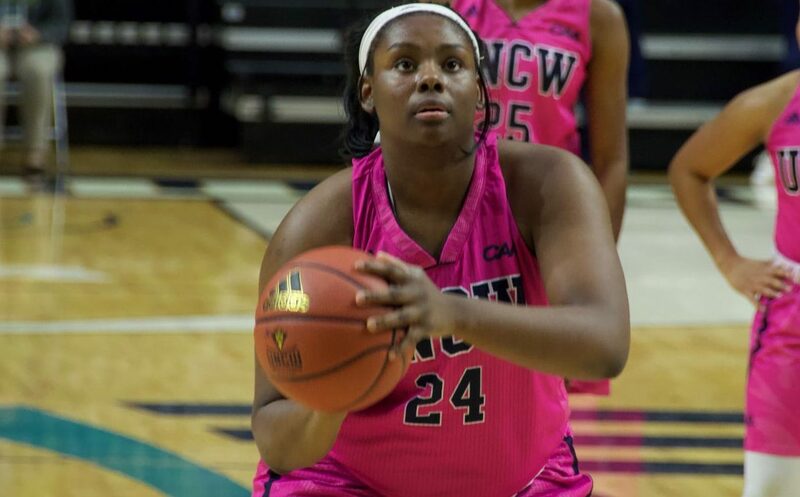 Her three-pointer at the end of the second quarter saw the Seahawks take a 51-23 lead into the locker room; it was the first time they had scored 50 points in a half since the 2012 CAA Tournament, in a game coincidentally against Hofstra. Smith and the Seahawks were more than happy to put last week firmly in the past. The Seahawks also had big efforts from junior guard Lacey Suggs (12 points, 7 boards) and redshirt senior guard Shrita Parker (15 points). UNCW jumps to 9-0 in home games this season. UNCW also clamped down on the defensive end. Hofstra star guard Boogie Brozoski, fresh off a career-high 34-point outing in Sunday’s victory over Northeastern, was held to only three points on 1-of-9 shooting from the field, with her only make coming from a three-pointer. Head coach Karen Barefoot’s strategy to contain Brozoski? Lock her down with guards Ahyiona Vason and Moriah Crisp. The Pride were led in scoring by junior Sandra Karsten, whose ten points made her the only Hofstra player in double figures. They struggled as a team offensively, shooting only 34% from the field. Sunday afternoon, the Seahawks have a date with Northeastern to conclude Homecoming weekend. The annual “Alumni Day” game, which will be the second of a four-game homestand, is set for a 1 p.m. tipoff.